New in August, 2006!At the Candlewood Suites Lincoln, we put the amenities where they really count: in your room. Fully equipped kitchens in every suite, large work desks & free high-speed Internet make the Candlewood Suites Lincoln the ideal extended stay hotel choice for the corporate traveler. Significantly more affordable than a corporate apartment, the Candlewood Suites is the perfect 'home away from home'. Stay with us for relocation, temporary assignment, or training needs. 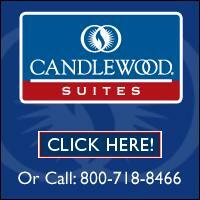 Additionally, unlike a corporate apartment, the Candlewood Suites does not require a lease or min. length of stay.In our studio or one bedroom suites, relax in the overstuffed recliner while you enjoy a movie on the DVD player. Borrow your favorite movies from our free DVD library or work off some stress in our complimentary fitness center.